Updating to the latest version of iOS is almost always a smart thing to do by owners of Apple devices from all around the world. While the process may be quite easy, the truth is that many are having trouble when it comes down to making the update. Here, you’ll be able to find the step-by-step instructions needed in order to make sure that you can easily update your iOS device to iOS 8. 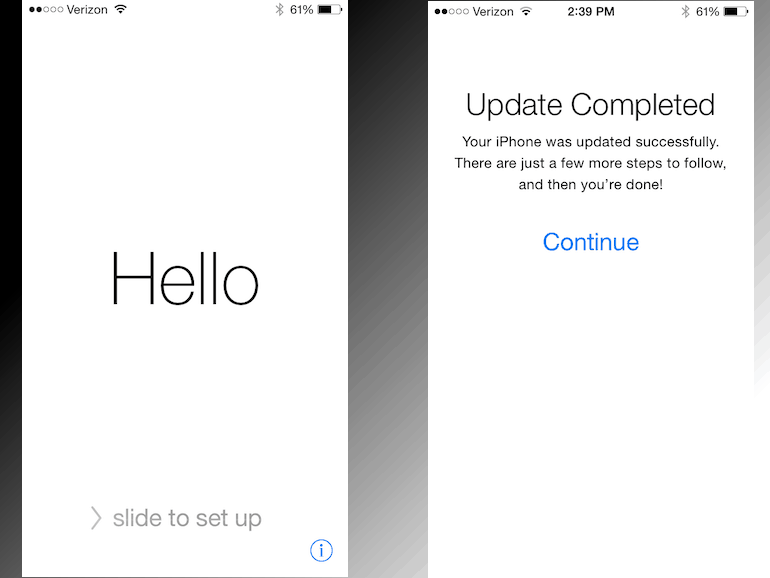 While this may sound like a suggestion that is not really fit for a how-to, the truth is that while you can update your iPhone 4S to iOS 8 legally and without encountering any trouble in the process, many people from all around the world have complained that the update significantly slowed down their devices. While this doesn’t mean that iOS 8 is bad, the software actually requires a great use of resources which in turn can make your device act slow if it’s already somewhat old. Before installing iOS 8, think about it, as going back to an older firmware is not an easy process at all. 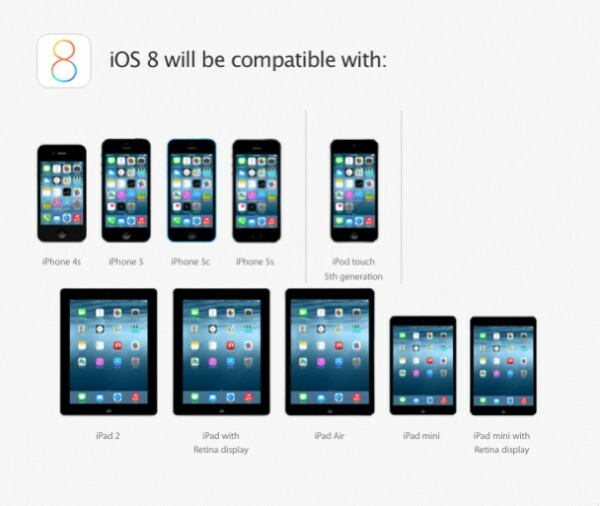 Also, it is wise to point out that you’ll have to check whether your device is compatible with iOS 8. Make sure to use the image below as a source of reference when you’re doing this. One thing is for sure. You don’t want your device to run out of battery before getting the update, as a simple procedure can turn into a very complicated one if this is the case. Additionally, it is also smart to finish doing whatever work you have to do on your device, as updating it will make it unusable for a couple of minutes. Turning on Wi-Fi can be easily done by heading down to the Settings app and click on ‘Wi’Fi’. Once this is done, you can turn it on and connect to any of the available networks at a current moment. Once you have your Wi-Fi on, your iOS device will probably announce you that there’s an update that you can get. If this is not the case, then simply head over to the ‘Software Update’ section that you can find in your Settings app. Once you’re there, your device will announce that there is an iOS update which is waiting to be installed. It may also showcase some more information about the update including which added benefits it has and so on. Once you read everything, simply click on update. Once this is done, your device will begin downloading and installing the update. Keep in mind the fact that during the process, your device may restart a couple of times. Mak e sure to not attempt using it and to not turn it off at any point during the update, as this can be harmful for your device. After a couple of minutes, depending on your Internet connection, your iOS device will turn on by itself with the latest version of iOS 8 installed and ready to roll. In the case that you do not have a Wi-Fi connection, or you would simply like to try updating your iOS device via your computer, then this can be easily done by following the procedure below. The first step towards making sure that you will be able to update your iOS device is to download iTunes from the official Apple site. A download link can be found right here. Once iTunes has been downloaded, it is best if you go ahead and install it onto your computer. The installation of this piece of software is easy, as users will only have to double click on it and follow the instructions provided by the installation wizard. Once iTunes is ready to roll, you can go ahead and connect your iOS device to your computer via a USB cable. Once this is done, iTunes will automatically identify your iOS device and display some information on the screen. On the bar that can be seen on the left-side of the program, you should see the symbol of a phone together with the name of your iOS device. Simply click on that in order to enter the dedicated iTunes platform for iOS devices. Once you have entered our device’s setting section on iTunes, you’ll have to go ahead and click on Check for Updates. After this is done, the software will quickly check whether there is any available update for your iOS device. If this is the case, a notification will appear where you can choose to download the iOS 8 update and install it. By simply clicking on ‘Download and install’, iTunes will go ahead and download the update and then proceed to update your device. Just like the update that can be done wirelessly, make sure that you refrain yourself from using your device during the process. Another crucial factor to keep in mind is not to remove your iOS device from your computer, as this will stop the updating process and give you a device that is practically unusable. We hope that you have enjoyed our how to use the iPhone when it comes down to updating it tutorial. For more how to use your iPhone iOS tutorials, you can check out our dedicated section right here. Additionally, if you have any questions, you can always ask in the comment section below.